The wannabe pros can get stuck sometimes into their own comfort. Let’s take a wannabe. Let’s take a female one. And she has this dream of one day making a living as a musician. Now, she’s got the instrument. She even cleared up her schedule to be able to practice. To top it all, she has a little avenue for her talents, like a band with a few gigs per year. You get the picture? And yet, this lady is not practicing like she should. She might be doing 30 minutes per day. If that. Sometimes, if the inspiration strikes her, she’ll pile up the hours on the drums or the piano (two great instruments! I know a fantastic instructor!). In general, though, her level is stagnating, her motivation is stale and her musical dreams are going nowhere. Honestly?! I do not know. People’s reasons to avoid moving forward are complex and difficult to sort out. I do undertake the task of helping my students in that journey and keep them motivated to play, but it is not an easy feat. Anyway, if I do not necessarily know what is happening, I know what might help. MIGHT! (Cause sometimes nothing helps!). Let’s suppose that the example I took was actually the one of a young lady. Let’s put her at less than 22 years old. Let’s put her in an urban environment. Boom: let’s put her in Chicago. Now, let’s say that she’s still living at her parents place. Let’s also say that her parents are nice, but only up to a certain point. You’ll see. Now that the movie set is ready, let’s make the actors do their parts. We already know about the activities and moods of the main character: the wannabe musician. All right, how about the parents? What are they thinking, what are they talking about? What do you think? They are talking about their daughter of course! And they are nice only up to a certain point. Are you guessing the conversation? I am. It’s not difficult. It’s pretty short. – Sweetie, our daughter is not doing much. We’re paying for everything, her food, her clothes, her phone, her car. – Yes, Sweetie, I agree with you. It can’t go on like this. – She’s going to have to go. – Yes, she needs to build her own life. When would be a good deadline? – I’d say three months. Next step, they break the news to the daughter. She has no college degree, she dabs in piano or drums, her band cannot afford her a roof and all the accessories that goes with it. As that beloved daughter realizes the depth of her troubles, something overwhelms her: fear! She is scared. Oh, she doesn’t think she will live under a bridge. She’s ready to take on a job that will make her survive. 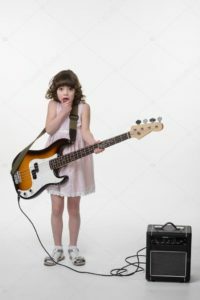 But she’s afraid that the dream of ever becoming a musician will never happen. And so now, she moves. In what direction, almost doesn’t matter.What matters is this: she’s moving, she’s motivated. Because we’re not playing anymore. Gimme them drums, serve up those keys! She’s gonna shape herself into what she wants. And, actually, she might make it. In any case, she has a better chance now. I meet them sometimes. They are 16 years old, they are 20 years old. They think they got it all figured out. They will be a working musician. It’ll happen. You watch. – Cool, I answer. How long do you practice per day? – Huh, 30 minutes, not every day. Sometimes I need to walk my dog, you see.